Labour member in Dún Laoghaire, Adam Hurley writes about our Greening of Ireland discussion at our 69th Annual Conference. On Saturday we held a lively discussion on our "Greening of Ireland" policy document where members, elected representatives and guest speakers outlined the challenges facing the environment and how Labour plans on tackling climate change. A 'Just Transition' for those working in the fossil fuel industry was viewed as critical to support the livelihoods of workers in rural areas. At #LP17 - Jack O'Connor was elected as the new Chairperson of the Labour Party. 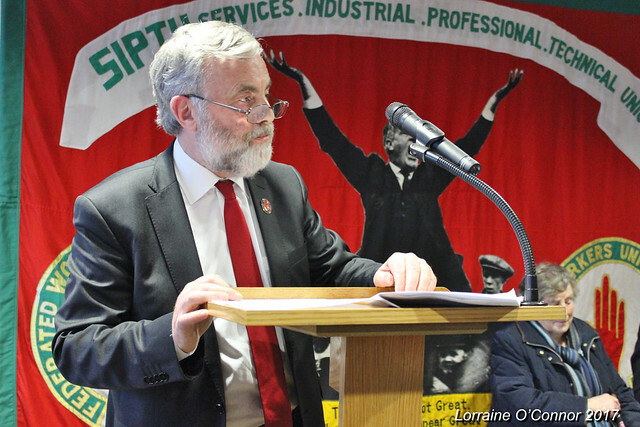 Jack O’Connor has been General President of SIPTU since 2003, having been re-elected in 2006 for a second term and in 2011 for a third term. He was also President of the Irish Congress of Trade Unions (ICTU) from July 2009 until July 2011 and served previously as Vice President from mid-2007. He has been a member of the Executive Council of Congress since 2000. Born in 1957, O’Connor is a native of North County Dublin. Employed in the agriculture, construction and local authority sectors, he was a trade union activist before becoming a full-time Branch Secretary of the former Federated Workers’ Union of Ireland in 1980. In the last of our pre-#LP17 selection conventions, Cllr Deirdre Kingston was selected as our candidate for Dún Laoighaire. For Deirdre, being a local representative is about honesty, it is about hard work and most of all, it is about putting the people you represent first. Deirdre plays a strong role in pursuing important policies on housing, transport, planning and community spaces on Dun Laoghaire-Rathdown County Council. Earlier this week, members in Dublin North West selected Andrew Montague as our candidate in the constituency. As a Councillor on Dublin City Council, Andrew has delivered many things for the City but the achievement he is most known for is delivering Dublin Bikes to Dublin. This scheme has been expanded to Cork and Limerick. The Ireland our daughters are born into today is vastly different to the country of our grandmothers, and their mothers before them. Women have served as our President and as TDs and Ministers in greater numbers. Women in charge of major corporations, sporting associations or media outlets are becoming the norm, not the exception. It’s certainly a long time since any majority would contend that a woman’s place is ‘in the home’. And yet, while Ireland has gradually transformed into a new society with far greater parity between women and men, there is still much work to be done. Tonight, the lad from Drogeda will be our first candidate selected for the next General Election. Ged is committed to tackling low pay, campaigning for a Living Wage for all and improving workers’ rights. Too many people work without any knowledge of how much, if any, work they will have the following week. People need security and stability in their working lives. There is a profound difference between flexible work arrangements that are freely negotiated, to mutual benefit, and multi-nationals hiring huge chunks of their workforce on low-hour, if-and-when contracts. Part-time work, fixed-term contracts, agency work and, in recent times with the large-scale adoption of smartphones, the so-called gig economy, have been part of a trend of casualisation of workforces in many countries. Those working in the gig economy make themselves available to provide service on an ad hoc basis in return for a fee which is split between the person who performs the service and the company. As a party, Labour is committed to State activism and intervention. The role of the State will be particularly critical in our transition to a low-carbon, and ultimately zero-carbon, economy. The market alone will not deliver the fundamental change that needs to happen. Sustainable energy is worth €1.5bn to the economy and employs 18,000 people. This can only increase. It will more than compensate for the inevitable loss of employment in older energy sectors, playing a huge part in a just transition for workers in these sectors. If we believe that by 2050 “fossil fuels will be largely replaced by renewable energy sources”, then we must right now accept the scale of the changes required and start making decisions. Moneypoint is one such decision. Bord na Móna is another. Its ‘Sustainability 2030’ plan is an important step towards adaptation, but it has been criticised as insufficiently ambitious. Do we make the case for accelerated change, given the serious challenges that the country and the company both face? We will continue to advocate a partnership between the company, its workers and trade unions and with the midlands communities who will be most acutely affected by the inevitable changes to come.